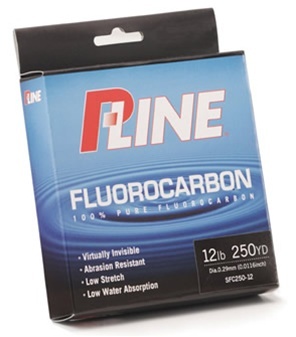 P-Line Fluorocarbon will improve your bite ratio. Fluorocarbon P-Line Fluorocarbon is extruded from the highest quality Japanese fluorocarbon crystals, ensuring the best knot and breaking strength available in a soft fluorocarbon line. As the educated angler knows, flourocarbon has a refractive index very close to that of water, making it invisible once it enters the water. Because of its inherent qualities, this line absorbs very little water giving it great knot strength. Another benefit is the low stretch factor, allowing increased sensitivity to feel the lightest strikes.